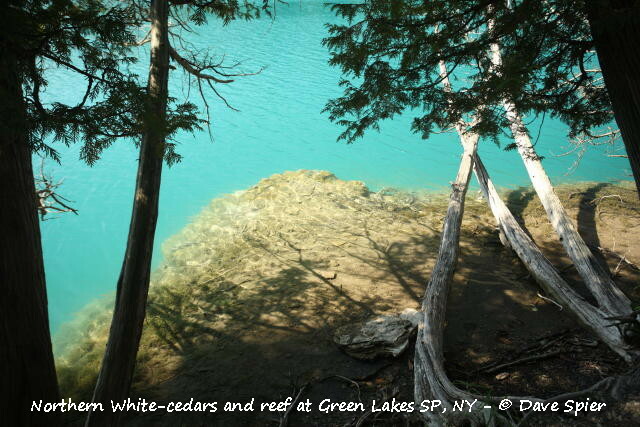 Donna and I were at Green Lakes State Park east of Syracuse, NY on Sunday (Labor Day weekend) and spent some time walking the lake trail on the east side and photographing the marl reefs. These are “microbialites” made by living organisms, in this case cyanobacteria that bind calcium carbonate from the dissolved limestone. 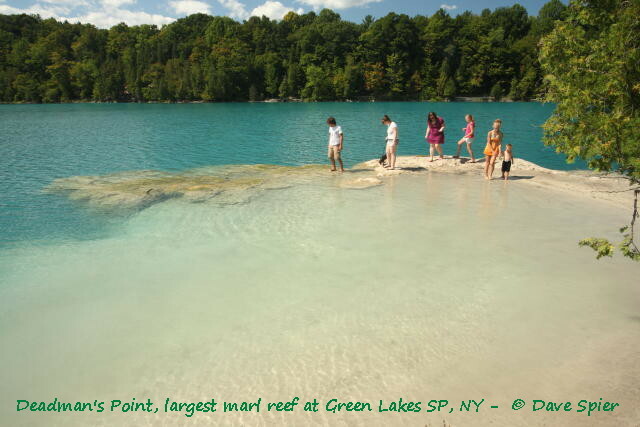 Deadman’s Point is the largest reef in Green Lake, and it’s partly exposed when water levels are low. It began thousands of years ago and continues to grow as cyanobacteria precipitate more calcium carbonate dissolved from the limestone and related dolostone in the surrounding hills. Algae, mosses, freshwater sponges and fallen trees add to the reefs and slowly become encrusted. The shoreline is dominated by Northern White-cedar trees (Thuja occidentalis), better known as arborvitae, which love alkaline limestone soils. At Deadman’s Point, these trees are 200 years old. The surrounding hills help protect the trees from stong winds. For a longer hike, you can add the Round Lake trail to the west. Along with the adjoing 59-acre old-growth forest, it’s now designated as a National Natural Landmark. The tallest tree is 147 feet high. Round Lake is 34 acres and 170 feet deep while Green Lake is 65 acres and 195 feet deep, so the top and bottom layers of water almost never mix, an unusual condition called “meromixis.” The cold bottom layers have a higher density due to salinity from Silurian salt deposits in the local rock layers. The warm surface layer has a lower density and tends to just float on top. 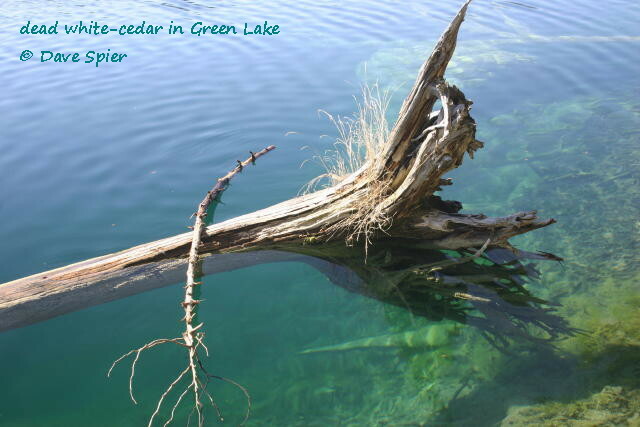 In addition, both lakes are nestled in basins that protect them from strong winds that would initiate mixing. 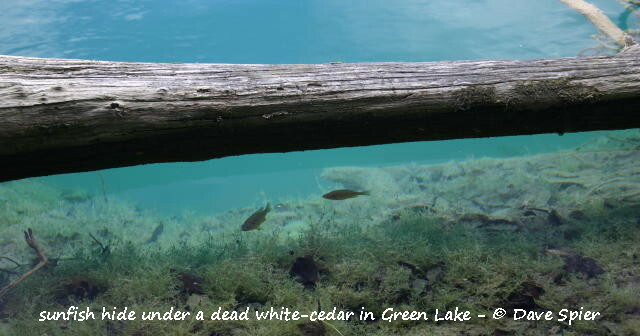 Green Lake was the first meromictic lake identified in North America, so it’s also the most studied. As I recall, Round and Green Lakes are pro-glacial plunge pools cut by rivers pouring off the top of the receding ice sheet at the end of the last Ice Age. The deep water below 55 feet is devoid of oxygen so sediments and organic matter are well-preserved on the bottom and can be studied to see how vegetation and the climate have changed since the end of the Ice Age. I like maps, but if you’re more comfortable with GPS, the USGS coordinates for the park are 43.0513738 N and -75.9658865 W. The eBird-hotspot coordinates for Green Lake are 43.0493361, -75.9646249. For a general overview of the park, visit ILovetheFingerLakes.com. Corrections, comments and questions are always welcome at northeastnaturalist@yahoo.com Also you can connect through my Facebook photo page at Dave Spier (photographic naturalist) or my personal page, Dave Spier (northeast naturalist). This entry was posted in geology and tagged calcium carbonate, cyanobacteria, geology, limestone, marl, microbialite, New York, Northern White-cedar, sedimentary. Nice photos and information to go with them, thanks. Haven’t been to GL in quite awhile, used to x-c ski there in the winter.